They moved into the home later known as the Jim Wallace home. They also built a new home in 1959. Oscar was active in the Erickson Chamber of Com­ merce, served on the Town Planning Committee with Linus Miller and Joe Lenkewich and was a member of the Erickson Lions Club. He was transferred back to Melita as Manager there in 1961. Oscar retired, to Winnipeg where he passed away on September 26, 1983. Vina was also active in the com­ munity, taught 4-H, and sang in the joint Lutheran Choir. Vina passed away in 1973, in Winnipeg, while they were living in Brandon where they retired. Marlene, born at Baldur in 1942, attended school in Melita and Erickson, graduating from Erickson Collegiate in June, 1960. She attended Teacher Training at Brandon College. While in Erickson, Marlene was a member of the 4-H club, figure skating, and played an active part in the life of both Bethel and Bethlehem Lutheran Churches. In 1964, she married Douglas Gruenke of Dominion City in Melita where they both taught school. 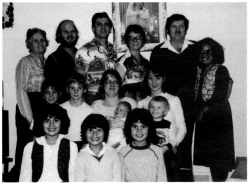 They had three children; Lynda at present studying at Brandon University. Trent in grade Eleven and Krista, in grade eight at Roseau Valley Collegiate in Dominion City. Douglas passed away in January, 1977, of leukemia and after his death, Marlene returned to her teaching career and is at present teaching grade two and music in K-6 in Dominion City. Heather, born at Melita in 1951, attended school in Erickson and Melita, graduating from Melita Collegiate in 1969. While in Erickson, Heather attended Sunday school at Bethlehem Lutheran and participated in the figure skating. She attended Brandon University from 1969-73, and started her teaching career in Rorketon in 1973 and moved to Flin Flon in 1974. Heather married Ric Lytwyn in 1975. Ric works for H.B.M. & S. and Heather is Head of the English Department at Hapnot Collegiate in Flin Flon. They have one son, Steven Scott, born in 1980. 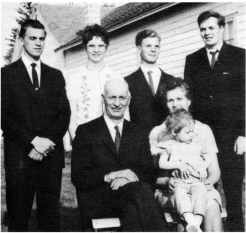 Kenneth David Graham came to Erickson in April of 1949 from Brookdale, Manitoba, as an International Harvester mechanic, working for Peter Slobodian. He had been working as a mechanic with this company at Brookdale for four years and as the shop was closing, the company arranged to locate Ken at the position in Erickson. His wife Dawn and children Joan and Jim, joined him in Erickson in June of the same year, when they were able to rent a house to live in. A third child Donald was born in Erickson and has always been very proud of the fact that he was part of Erickson. John and Joan Plaetinck, Donald, Jim. Seated: Kenneth and Dawn Graham holding granddaughter Carolyn Plaetinck. there until November, 1968. He then established his own business again at the "Peter Slobodian" shop, and worked there until his death in January, 1970. Ken was active as fire chief for the Erickson Volunteer Fire Brigade for many years. He also loved to curl, was active on both the curling and skating rink committees. He was also a charter member of the local Lions Club. Dawn Graham worked at the Grey Owl restaurant at Clear Lake for the summer of 1965. She then secured the position as assistant cook at the Erickson Medical Nursing Unit. Later she was appointed head cook and worked at the Hospital from 1966 until 1982, when she retired. Ken and Dawn Graham Family.